A woman sits atop a rock viewing a large chunk of ice in the Iceberg Capital of the world known as Twillingate, Newfoundland. Twillingate in Newfoundland, Canada has been stated as the Iceberg Capital of the world and thousands of people come yearly to see these incredible masses of ice. The rugged coastline along Twillingate, Newfoundland is a vision of beauty on its own but being able to see an iceberg float by gives one a whole new outlook on the natural wonders of life. 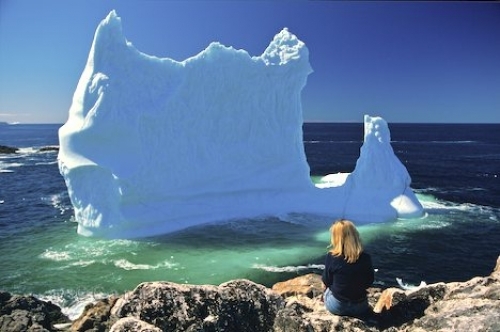 A woman viewing an iceberg beached at Twillingate in Newfoundland, Canada. Model Released. Picture of an iceberg passing by Twillingate, Newfoundland also referred to as the Iceberg Capital of the world.